The kids and I did our first big road trip adventure of the season on the last weekend in March. We heard about a bird festival over in Central Washington, we had some free time, and we decided to go. The kids had been requesting a trip to the desert, too, and no snowshoeing, please, so this fit nicely with what they wanted. I was fortunate enough to get lodging for the night with one of Aaron’s cousins who lives about an hour from Othello. That made it much nicer than just making the long drive for the day or trying to camp in the cold. We got out of town in good time, but were a bit surprised to find it snowing over Snoqualmie Pass when we went over. Thankfully there was just a bit of slush on the roadway. It turned to rain on the other side. The kids thought it funny that it was raining so hard in the desert. I didn’t think it was that funny, but tried to hide my disappointment. We stopped at the Ryegrass Rest Area east of Ellensburg and had some lunch. There is a little path around the perimeter of the property, and we were delighted to find some pretty little desert blooms brightening the landscape. This is a great place to stop for a leg-stretcher, and let the little ones (and big people) run around. We pulled into Othello in the middle of the afternoon. It was still raining. 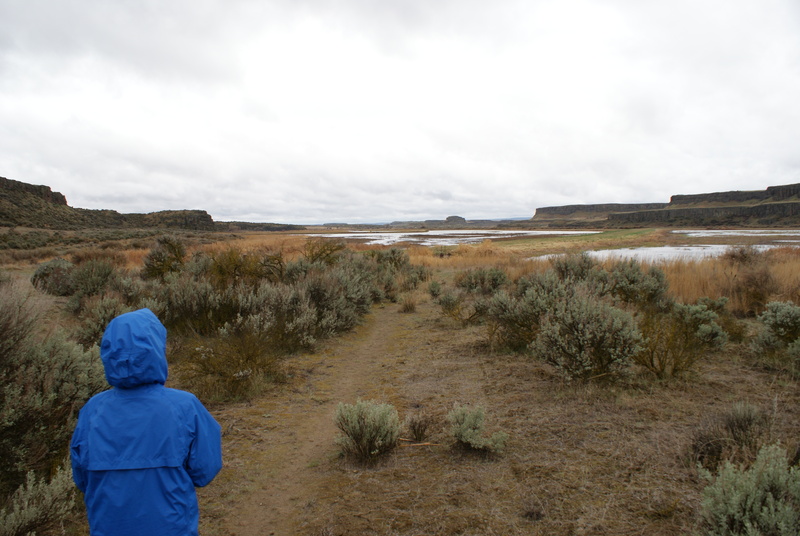 We decided to check out the Columbia Wildlife Refuge anyway, as there were some trails to walk on and an open house that afternoon at the refuge office. We picked up a trail map at the kiosk just outside the fence at the entrance, and found our way to the hiking trails. 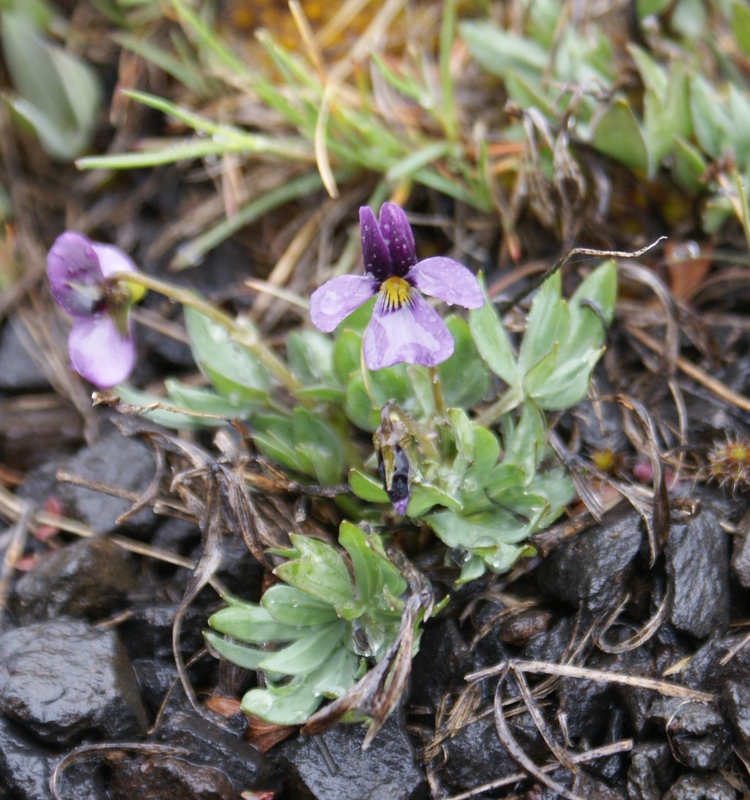 At first we stopped at the wrong pullout, and wandered around confused in the pouring rain. But then we drove on to find the correct trailhead, and it was well marked. We did the Marsh Loop, and thankfully it stopped raining. We saw many different birds, but the most interesting were the wheeling flocks of red-winged blackbirds. I don’t think I’ve ever noticed them in flocks before, and it was fun to watch their acrobatics and listen to their funny sounds. All the trails from this trailhead would be fine for kids of all ages, especially if they like birds. After we had walked around, we went back to the main refuge office, and visited the rangers for their open house. 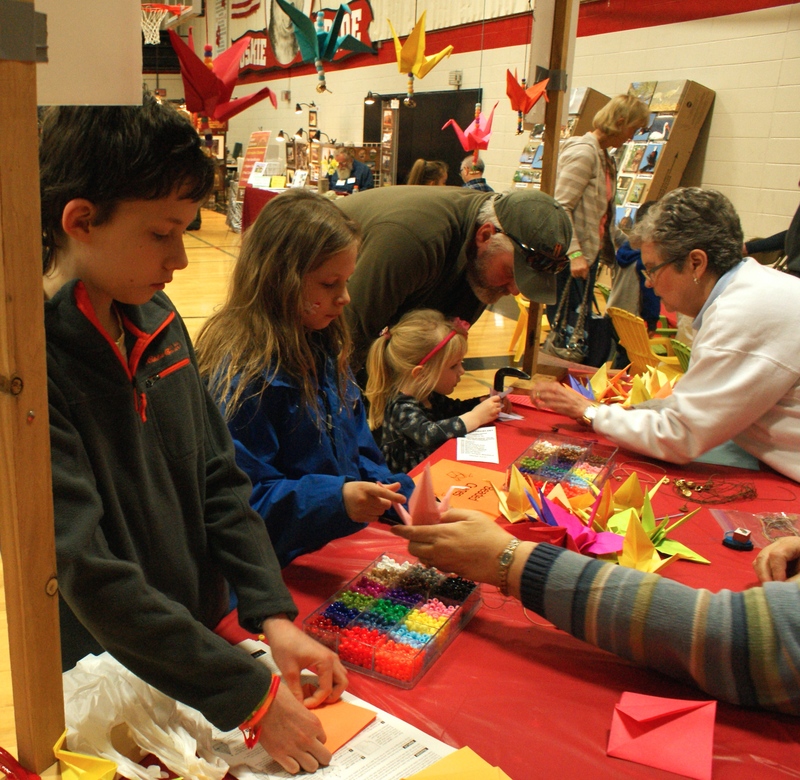 They had a remarkable variety of natural items on display, including some stuffed cranes representing the birds we had come to see. They gave us a map of the refuge and surrounding area, marking on it where and when we were most likely to see cranes over the weekend. We also picked up a festival brochure so we could plan our day tomorrow. We spent the night in Kennewick at Aaron’s cousin’s home. It was really nice to have a warm, dry place to stay, and a comfortable bed. The next morning we got an early start and were up at the festival in time to check some of the exhibits out before going to our first class of the day. We listened to a researcher talk about the sandhill cranes, their biology and migration habits, and then he showed a video about the cranes. This video was remarkable – it was created by people in Homer, AK, where the cranes spend the summer, breed, and raise their chicks (called colts). Some of the footage was pretty incredible, of the baby cranes growing up and learning how to be cranes. We took turns throughout the day attending classes and looking at the exhibits, and doing the kids’ activities. Annika liked the activities and crafts, but Gabe is getting a bit old for these kinds of things. He was very polite, though, as she worked through the activities, and he did participate in most of them so he could get the prize at the end. The kids and I were enamored by the raptors on display all day. 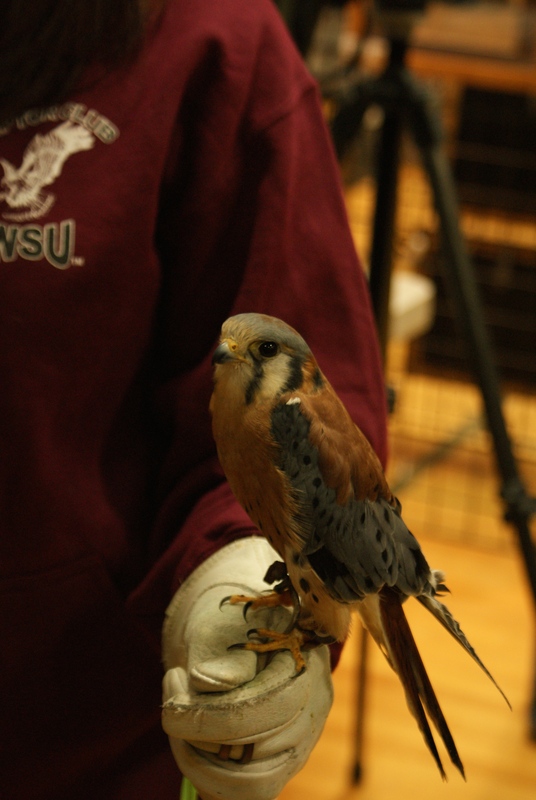 I never knew that WSU has a Raptor Club on campus, as part of its veterinary school. All the birds on display had been injured somehow and wouldn’t survive in the wild, so they were used as teaching birds by the members of the Club. It was fascinating all day to go up and get a close look at these fabulous creatures. I think I know a little girl who might someday attend that school so she can join the club. 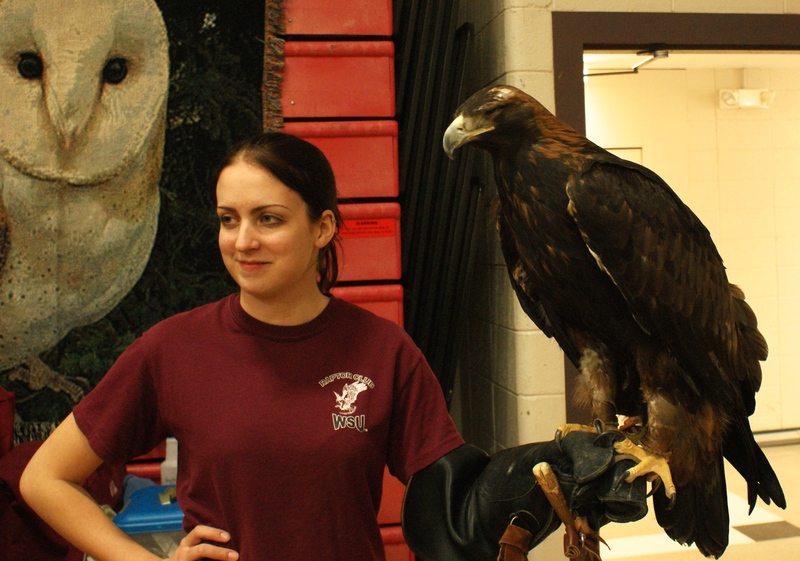 The Raptor Club also presented a class in the afternoon about their birds, and of course we had to go to that. In between, we attended a class about how birds make their nests, which we found very interesting. If we were to go to the festival again in the future, I would make some changes in how we approached the day. First of all, I’d probably get a room to stay in Othello. 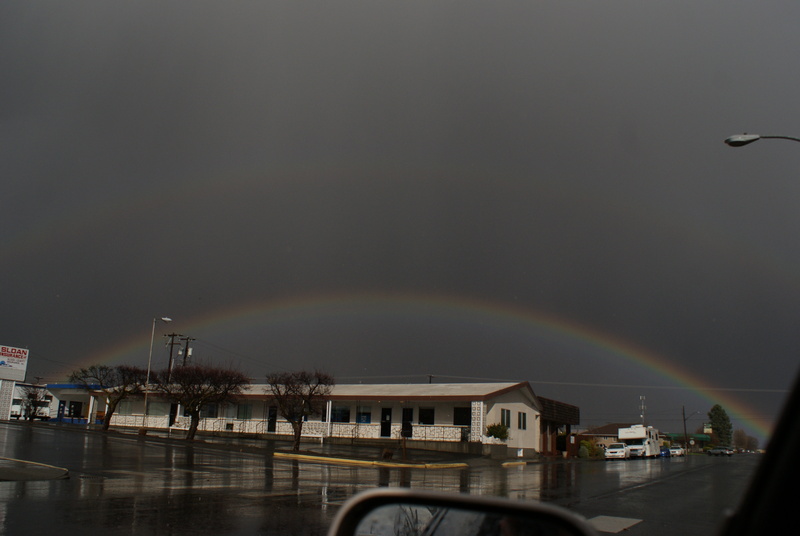 It was a long drive down to Kennewick and back after driving all the way there from home. Also, I’d reserve a tour in advance, as the tours to the crane feeding areas, as well as burrowing owls and ground squirrel nesting sites, were already full in the morning when we arrived. I’d probably attend another class or two during the day and skip the kid crafts, but then I’d have one child who was disappointed. After the last class, we decided to drive through the refuge again, hoping we could see some cranes coming in for their evening feeding. The day had been sunny up until that point, but thankfully the rain shower moved off to the east and we had dry skies for our birding. 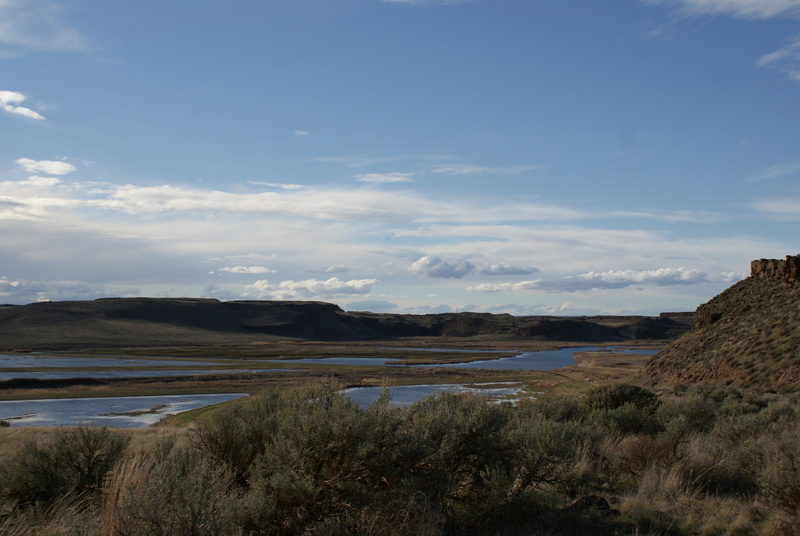 We drove the north/south road, and pulled off at one area overlooking a closed portion of the refuge. 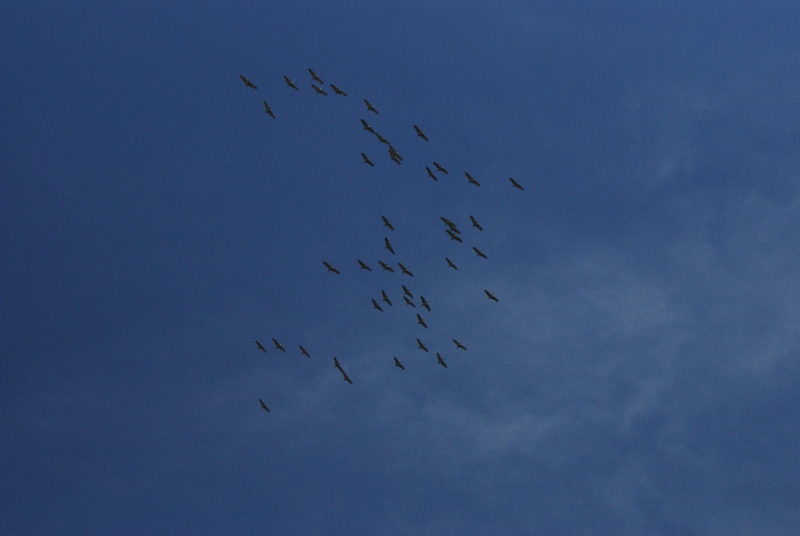 When we got out of our car, we could hear a large flock of cranes overhead. They didn’t land down below us, but did fly overhead and obliged us with their distinctive noises as they communicated above. We thrilled at hearing and seeing them en masse, and it seemed to make all the driving and hoping worthwhile. We also heard some canyon wrens at that location, which was a first for us as well. 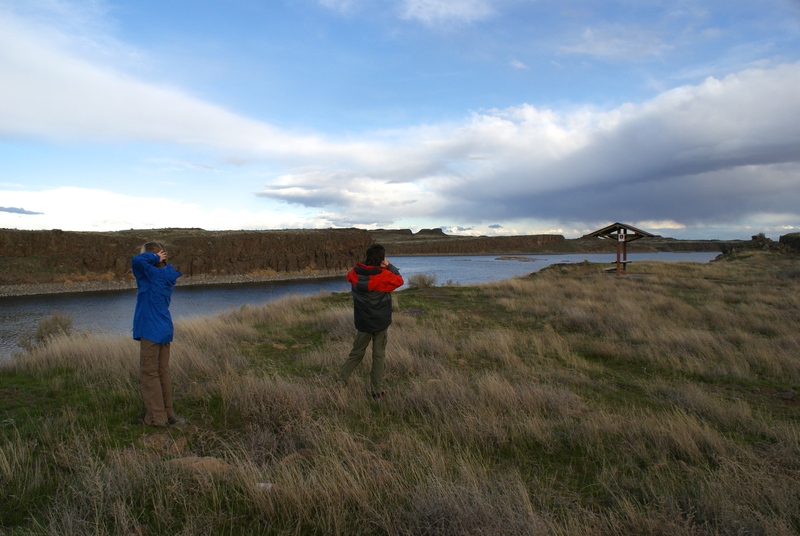 They flew off, and we drove on northward, stopping at Soap Lake to look around. There are outhouses and picnic tables there, but we decided to drive on a little bit to find another place to stop for dinner. 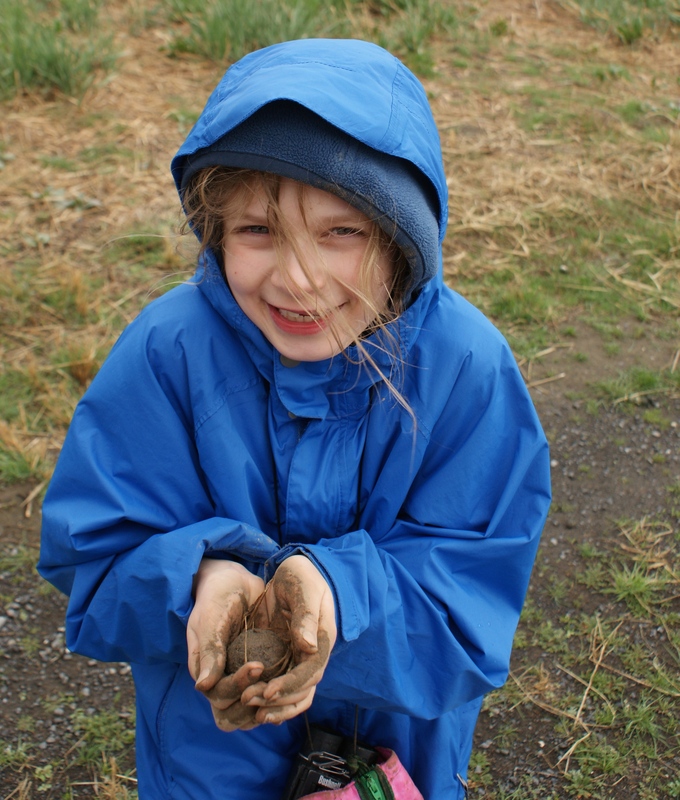 We settled on Potholes State Park, which has a developed area for picnicking, camping, and playing. As the sun set, we made our way back to the highway for the long drive back home. We saw some more cranes in the dusk, in farmers’ fields west of Othello. I’m really glad we took this trip, as long as it was, and as much driving as it took. We learned so many new things, we got out of the western grey and into the eastern grey and sunshine, with open vistas and fragrant sage. Othello is a really long way out there – it took us over 4 hours to get back when we drove almost straight home. 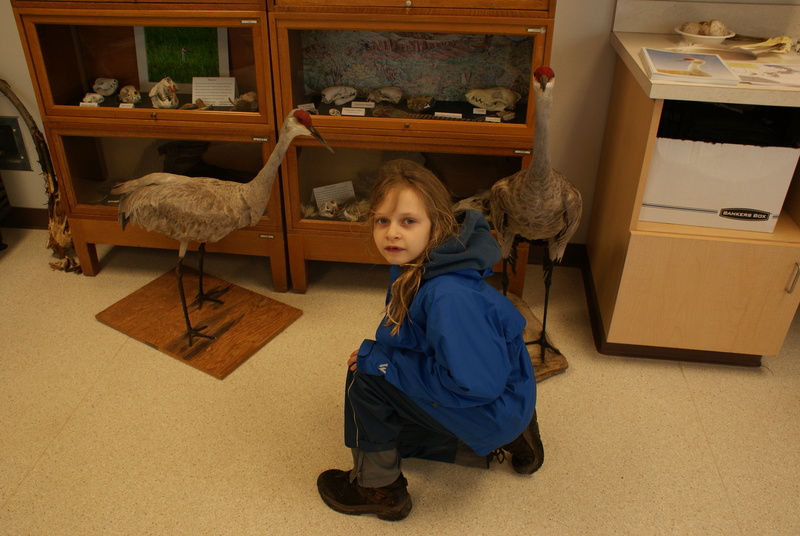 We enjoyed the different birds we saw, and this was the first time we talked about the Ice Age Floods that scoured and shaped the eastern half of our state. 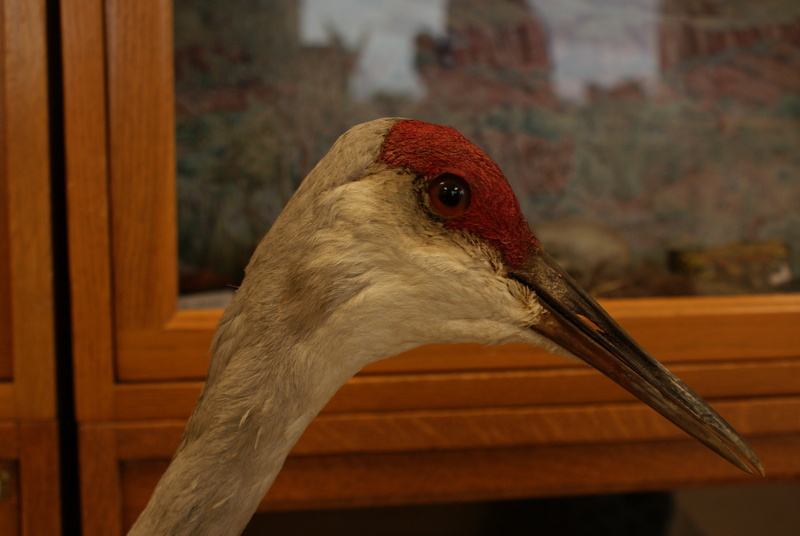 If You Go: Begin by perusing the Othello Sandhill Crane Website for information about scheduling and lodging. If you want to go on any tours, sign up ahead of time. If not, you can just pay at the door. 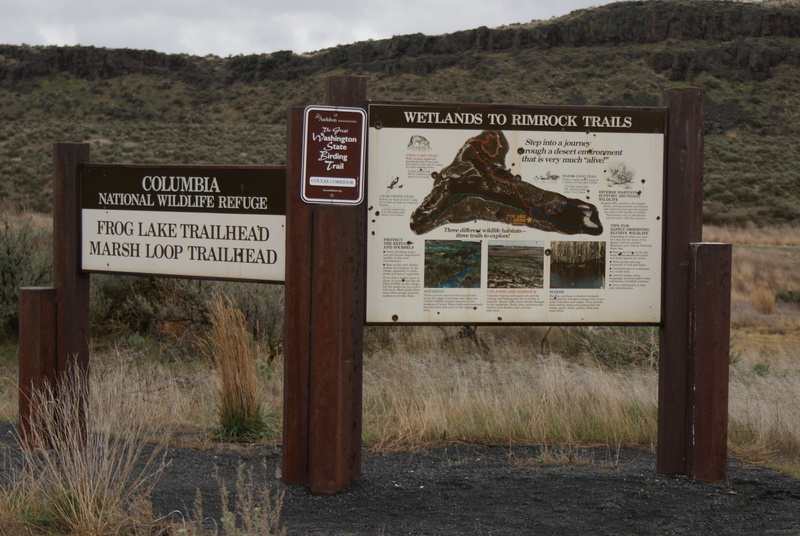 The Columbia National Wildlife Refuge is an exciting place to visit in the springtime, with its migrating birds and greening landscape. The Refuge is open seven days a week, from sunrise to sunset. The Refuge office is open 8-5, as long as staff are around and not in the field as part of their duties. It is in a remote and rugged portion of the state, so make sure you are prepared with food and water for your trip. The main roads are passable for most passenger cars. The nearest state park is Potholes SP, which allows camping year-round, though the cabins weren’t open for the weekend of the festival. I probably wouldn’t tent camp there this early in the year, unless the weather was unseasonably warm.